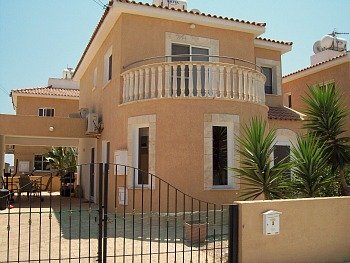 Our Cyprus villa to rent long term is in the quiet village of Xylofagou. Only 10 minutes drive to Ayia Napa and 30 minutes to Larnaca airport. With friendly, helpful Cypriot and British neighbours who are always happy to help each other in anyway they can. Our Cypriot neighbours love to share local fruit and vegetables with everyone. So don't be surprise to find a bag full of oranges, lemons, lettuce, potatoes etc on the door step! A bright, airy. 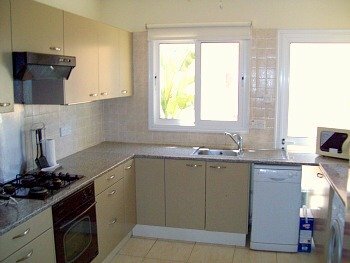 fully furnished 3 bedrooms Cyprus villa to rent with every possible thing you need during your stay. All you need to do is move in and put the kettle on. To makee you feel right at home, we will leave you a welcome pack of basic essentials that includes; coffee, tea, milk, sugar, bread, butter and fresh bottled water. So you can just relax. Our detached villa has double gates into the driveway and cool shady car port. There is also a single gate entrance leading to the front door on the right side of the property. The front, side door and most of the windows have flyscreens fitted to keep those annoying flies out and let fresh air in. Large bright and freshly painted lounge with circular front bay. 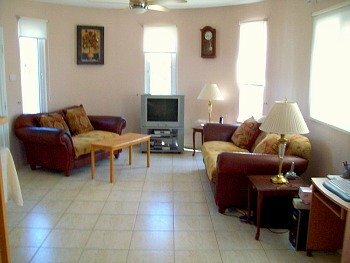 Fully furnished with comfy sofas. Free to view satelite television, DVD player, telephone point. As you can see from the image below the sunlight streams through the lounge almost everyday of the year. Very cheerful! 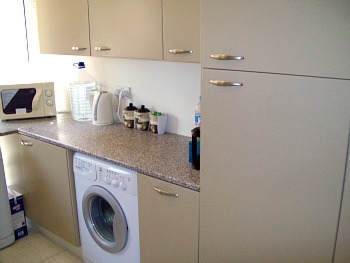 Fully fitting Ikea kitchen with 2 floor to ceiling storage cupboards, one with handy slide out shelves. There are plenty more upper and lower storage cupboards and drawers. Large fridge freezer, washing machine, dishwasher, new stainless steel finish microwave, cooker with gas hob, electric oven and kettle. No need to spend on any cooking equipment, you will find everything is supplied for you. All pots, pans, utensils, crockery and cutlery. Most of the time we have used it as a dining room. 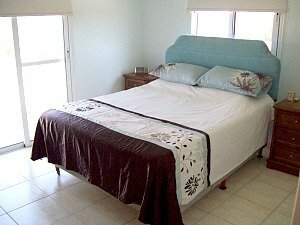 If you like the convenience of a downstairs bedroom we have a z-bed available. There is a guest shower room with wc right next door. A marble staircase leads up to the master and second bedroom, with a solid wood door at the top, which is great as sound proof between floors. The large freshly decorated master bedroom has its own ensuite shower room and toilet. It also has 2 double floor to ceiling wardrobes, tv and telephone connections. Double Patio doors lead out to a semi circle balcony with Greek style marble ballastrad surround. Blackout roller blinds and flyscreen fitted to window and patio door. The second bedroom is also double sized with fitted wardrobes plus 2 shelved wardrobes and cupboards above. Window with fitted fly screen and black out blind. The main bathroom is situated next to the second bedroom. Its larger than your average bathroom. Mediterranean blue and white tiling, white bathroom suite, overhead shower in the bath with screen. Built in sink with large vanity unit and double floor to ceiling storage cupboards. The bathroom window is also fitted with a fly screen.